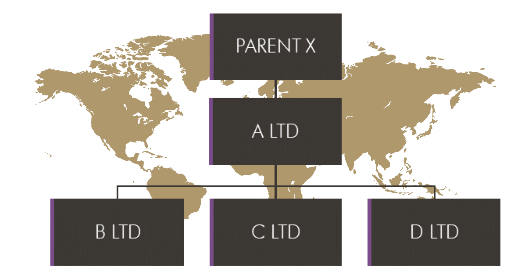 International businesses that have established, or are considering establishing, holding companies and/or subsidiaries in Ireland, should be aware that all Irish companies are required to prepare and file audited financial statements with the Companies Registration Office (CRO) on an annual basis unless the company avails of exemptions to which it is entitled under the Companies Act 2014. 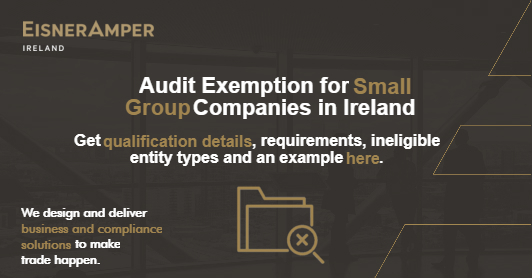 In Ireland, an audit exemption is available to companies in a group structure where, inter alia, the group qualifies as a small group. no member of the group can be an ineligible entity (see below). These requirements apply to the largest group of which the company is a member, with all group undertakings being considered irrespective of their jurisdiction. A group does not qualify as a small group if one or more of the group companies are ineligible entities (as per section 275 of the Companies Act 2014). Such ineligible entities include, inter alia, credit institutions, insurance undertakings and entities that have transferable securities which are traded on a regulated market of any EU Member State. The following example illustrates the application of the Small Group Audit Exemption. The aggregate turnover for the sub-group headed by “A Ltd” is €11m, the sub-group’s aggregate gross assets are €4m and the sub-group has 51 employees. Even though the sub-group headed by “A Ltd” meets two of the three small group requirements, companies in this sub-group cannot avail of the Small Group Audit Exemption as the largest group of which they are members (i.e. group headed by “Parent X”) does not meet the criteria to qualify as a small group. Thus, these companies would need to be audited, unless they can claim audit exemption on a different basis. It is important to note that even if an Irish subsidiary has not traded it may not be able to claim the audit exemption if the group as a whole exceeds the requirements noted above. Also, companies in both a group and non-group situation will not be entitled to audit exemption for two years immediately succeeding a financial year where the annual return of the company is not filed on time. In addition to providing advice in respect to whether your company can avail of the Small Group Audit Exemption (or indeed any other audit or filing exemptions that may be available) our Statutory Financial Statements Preparation team, who work closely with our Company Secretarial team, can assist with the preparation of unaudited statutory financial statements for filing with the CRO. Learn more about our Statutory Financial Statements Services here. Request a statutory financial statement preparation quote or callback from our specialists now.